It's hard to believe it's July already. First things first. We will be closed on Saturday, July 4th. Well, June sure was a good quilting month, wasn't it? The lawns are squishy around here. Mom didn't fill my pool all the way here at the Shop before the rains came and boy is it full now! I find it a little fishy that this year's Row by Row Experience theme is water, don't you? Row by Row Experience is in full swing. We have met some new quilters as far way as New Mexico so far this Summer. A few area quilt shops have gotten winners already. We have not. Our bundle of 25 fat quarters and, if our row is in your quilt, 6 books and a $10 gift certificate is still waiting for someone to come in. 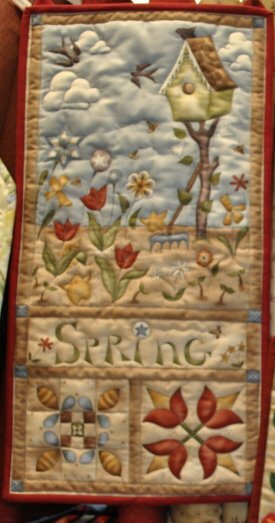 Once we have a winner, we will hang their quilt so the winner can show off their quilt in our gallery. Hey, you put all that work and collected those patterns, you should show it off! July is a special month for me. On July 11th, it will be one year since I came home to live with my Mom and 4 legged sisters. On July 12th, it will be one year since I got the job as Official Greeter here at the Shop. I love seeing and greeting everyone. Especially, my special girlfriends who bring me treats. Christmas in July Sale coming up in a few weeks. July 22-25, all our Christmas fabrics will be 18% Off. Come in and stock up on Christmas fabrics and help us clear the shelves for new Christmas fabrics that will soon be rolling in. 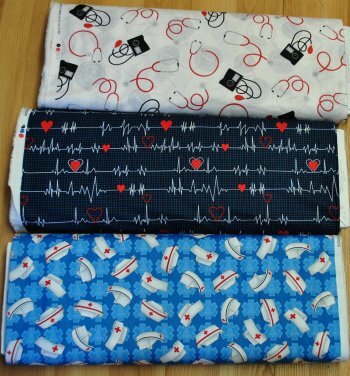 We have some nurse themed fabrics that just came in. They're pretty cool and you could make some pretty cool gifts for your favorite nurse! Mom's old, she said she remembers when nurses wore hats like these when she was a kid. We do, unfortunately, have some sad news. The Quilt Barn fabrics are on back order. We called the supplier and were told it would be at least until September before we get our shipment. Needless to say, we were not happy to hear this news. We will keep up updated on this collection. We know a lot of you are waiting on pins and needles for it. On to some more happy news. Here is some show and tell for you. 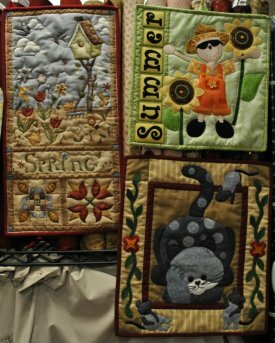 Lois E.'s mini wall hangings. We think the cat's expression is so darn cute! 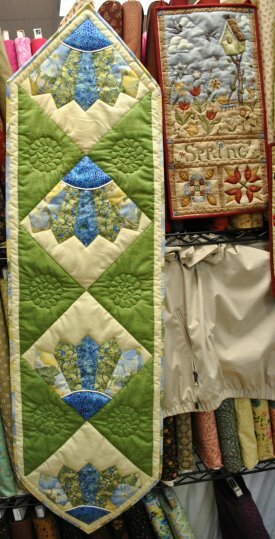 Isn't the quilting just beautiful? Look at all that beautiful applique work! See, there's nothing to be afraid of with applique. We hope everyone has a safe holiday weekend and we hope to see you on Monday. Obi the Wonder Dog, Mary Lou and Maryanne.